Massive cost increase in energy, raw materials, taxes as well as environmental protection and problems for locating and retaining skilled employees has made manufacturers struggle to survive in recent years. These challenges can be solved with the help of mergers and acquisitions, relocation to low-cost regions, and more importantly, using new technologies to improve manufacturing processes with low operation costs. The complex operation process of manufacturing creates the incentive for technology development and implementation. The industry plays a key role in driving innovative technologies adoption to increase productivity and reduce costs to meet different consumer needs. By leveraging industrial automation, it helps manufacturer to keep track the inventory of raw materials, work-in-progress (WIP) and finished goods with higher visibility throughout the entire production processes. 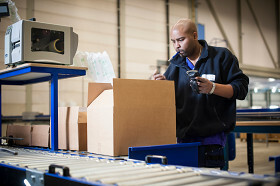 A turnkey Warehouse Management System (WMS)simply improves operation productivity by utilizing Barcodes, RFID or Voice technologies to collect and manage inventory movement on a real-time basis. In addition, extended Electronic Data Interchange (EDI) capabilities provide a distinctive advantage and competitive differentiation for manufacturers by enabling the smooth and timely data exchange with other trading partners electronically. As a result, it improves business performance and provides better sales and inventory forecast.